A new cooktop is a great way to transform your kitchen. It not only gives your kitchen a facelift, but makes your cooking environment easier to use. Our collection of cooktops integrate the latest in technology and kitchenware development to redefine your cooking space. We cater to kitchens of all shapes and sizes or any unique spatial needs. 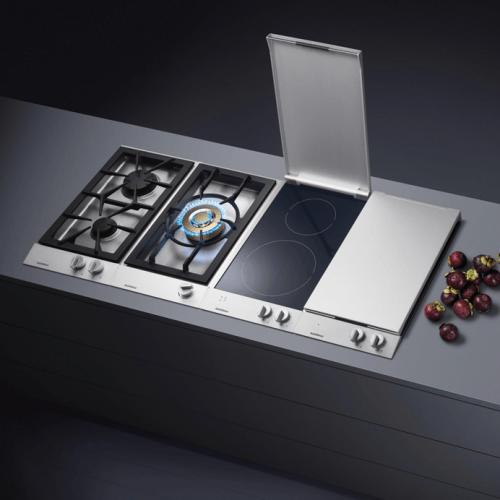 With options in gas, induction and electric – many modern advances in design and functionality have increased the capacity for not only more efficient cooking but also opened up the once humble cooktop to become a feature of your kitchen design. A cooktop is a must for all fully functional kitchens. Now you can choose a modern one that makes for convenient cooking while looking impressive without a large oven in the way. A cooktop is easy to clean and maintain, especially if it is electric or induction. The flat surfaces make cleaning a breeze with just a quick wipe down after use. 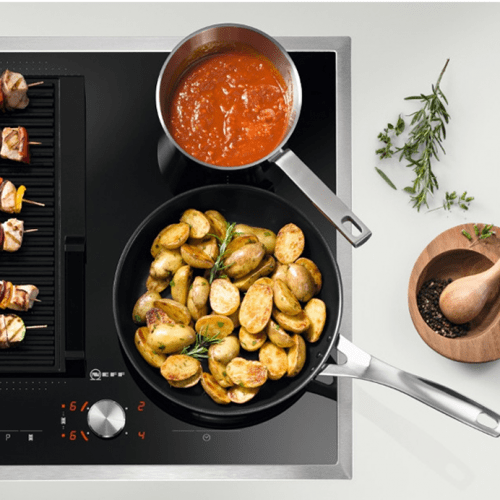 A separate cooktop is becoming a newly popular choice in kitchen appliances. If you want a bit of luxury that will impress while making cooking and cleanup easy, then it is the smart choice to go for. Like the ovens, there are three heating types. The two classics gas and electric are options. There is also a newer, more modern type to consider. Gas cooktops the same as the freestanding version. The gas powers the flame. The flame heats the pan and cooks the food evenly. It is down to personal preference whether gas is suitable for your home, especially since a naked flame is involved. However, it is safe to use and has been the cooking choice for over 200 years. Going old-fashioned doesn’t mean your cooktop has to look like it. Gas cooktops have undergone amazing transformations over the years. You can cook with your favourite element in a new way. A modern cooking element becomes even more advanced. In the past, electric rangetops and cooktops had raised coils that were unsightly. Those have vanished with new electric cooktops looking more stylish and attractive than ever. Electric ceramic tops are flat, making clean up quick and easy. Ceramic tops need to be handled with care. It is advised not to use cast iron or other heavy pots and pans. Try to avoid dropping anything onto the surface, so they don’t become damaged. If this happens, our team at Brisbane Appliances are happy to recommend repair agents we know can sort out your electric ceramic cooktop quickly. This new technology is a wonder. The cooktop uses an electromagnetic current to heat the food. Water boils in a few minutes with this quick cooker. It cooks all food faster than gas. It is safe and easy to clean. Only the pot or pan is heated. The cooktop remains cool and cannot burn. Unlike electric heating, an induction cooktop will cook very quickly, which is reassuring, especially when children are around. Because the cooktop stays cool, spills are not baked onto the induction cooktop. Simply wipe the mess up after cooking. Because it heats differently, you may need to invest in new cookware if you are going for an induction cooktop. Magnetic cookware is recommended. You can test existing pots and pans with a magnet to see if it will work. Your cast iron pans will work perfectly on an induction cooktop, unlike its electric counterpart. A freestanding oven will give you an oven and a cooktop combination. However, if your oven is gas, usually your cooktop will be gas too. Want to keep them separate or just want to add more options? If you go for a wall mounted oven, then a cooktop to match it can be installed. Your kitchen will have a contemporary look and feel to it. Plus, there are many combinations to choose from with our wide range available at Brisbane Appliances.